Milfred Reno Yant was born July 23, 1898, in Alger, Hardin County, Ohio, to Ward H. and Henrietta Yant. Milfred completed the second year of high school before enlisting in the Navy during World War I. He signed up April 26, 1917, at the recruiting station in Cleveland. He went to boot camp at Naval Station Great Lakes outside of Chicago, was at sea 36 days and served as a Seaman, Second Class for 166 days before being (honorably) discharged Nov. 14, 1917. Records indicate he had a physical disability and was hospitalized in the Naval Hospital at Great Lakes. In 1919 he shows up on a ship's manifest arriving from Liverpool, possibly with a wife. Another ship's manifest from September 1943 shows him arriving at Honolulu as a civilian employee of the War Department. On Dec. 19, 1963, the 64-year-old Yant wed for (at least) the second time. His bride was 35-year-old Maria E. Charles. Apparently this marriage ended prematurely, as well. Yant, then living in Laredo, Texas, was listed as a "widowed" "miner" when he suffered a heart attack and died at the VA Hospital in Houston on Sept. 16, 1972. 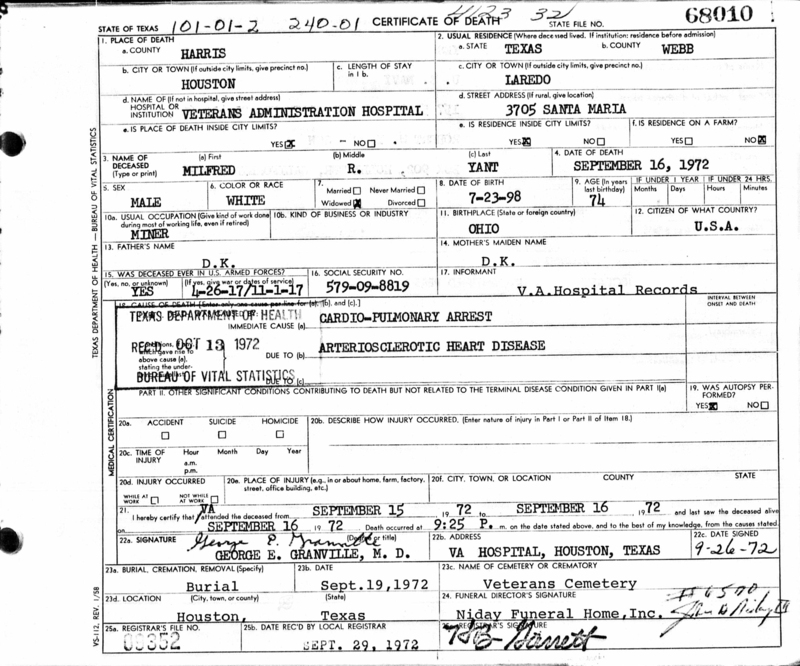 He is buried in the VA Cemetery in Houston (Houston National Cemetery). 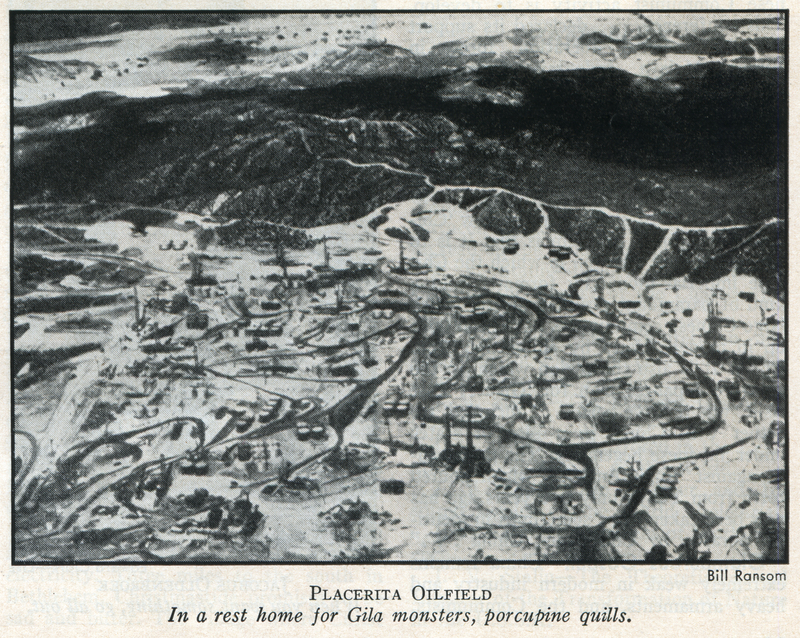 What started out as Milfred Yant's confidence game in the 1930s to bilk investors out of their money by sinking it into a phantom oilfield in Placerita Canyon turned real in the 1940s when, after a prison stretch, Yant returned and unwittingly hit paydirt. The result came to be known as Confusion Hill when Yant's old victims tried to perfect their claims and physically brawled over drilling rights. It took the courts to sort it all out. One has to wonder how long it would have taken folks to discover the riches that underlie Newhall (west of Sierra Highway between Placerita and Golden Valley) if Milfred Yant hadn't come along, at least to turn up the clock a bit. Well over half a century later, those riches are still paying. 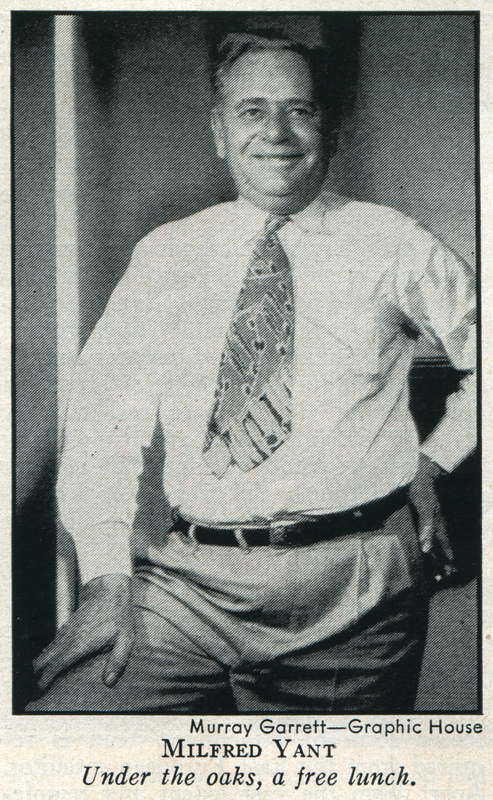 Milfred Yant is a man with a remarkable air of respectability; it is accentuated by his pudgy figure, his middle-aged stoop, his brownish hair and open countenance. Back in 1935, as a result, he had little difficulty in selling acres and acres of steep, arid, brush-covered land in the barren hills above Los Angeles County's Placerita Canyon. The tract looked like a rest home for Gila monsters, but he got $1,950 an acre for it — just $1,900 more than he had paid. His system was simple. He erected a corrugated-tin "clubhouse" on land (which he leased but did not own) in the oak-shaded canyon bottom. Then he lured aging citizens 34 miles from Los Angeles by offering free bus rides and free lunches. From the clubhouse he allowed them to catch sight of four broken-down old oil derricks which stood near by. Before they left, most of his prospects were convinced that 1) Yant's land was in the grassy canyon bottom and 2) an ocean of oil gurgled just below the surface. Promoter Yant sold parcels of land as small as a hundredth of an acre. An agent (employed by Yant) sought out the small buyers, confided that he represented a major oil company, and offered $5,000 for a full acre; many hurried back and bought more land. They never saw the mysterious oil agent again. At the end of the first year Yant was going strong; he had raked in $242,000 and still had considerable acreage left. But the customers finally got restive. Con-Man Yant ended up doing two years at San Quentin. After he was turned loose, the law found it necessary to lock him up again for violating his parole: he had celebrated his release by helping a friend bilk an old lady out of her money. When he got out the second time, the war was on. He went to Honolulu, talked himself into a job with the Army Engineers, and in three months was bossing 300 electricians. Then he returned to the mainland and, despite his prison record, got a job at the Hanford atomic-energy plant. In 1944 he went back to California. He opened an electrical-appliance store in the little town of Hollister, and lived quietly. But early this year he got back into action. One of his customers was a wealthy Spanish cattleman named Ramon Samovia; Rant confided to Samovia that oil had just been discovered near some property he owned in Placerita Canyon — he would be rich as soon as he dug up enough money to sink a well himself. Samovia bought into his scheme for $53,000. Yant dutifully sank a well, not near the canyon bottom as Samovia had expected, but high on his own hilly acres. To everyone's amazement he hit oil: 2,000 barrels a day. He sank four more wells, brought in a producer every time. By this time, Samovia, who had heard a little of Yant's complicated past, had sold his interest to a rich Texas oilman named Tevis Morrow. Morrow rushed in 18 bulldozers, five drilling rigs and an army of roughnecks; he spent half a million and in 45 days had sucked 240,000 barrels out of the barren ground. A wild boom began as a horde of lease-hungry oil speculators and scores of Yant's once disgruntled suckers (many of whom had never filed their deeds) converged on the canyon. The results were spectacular. Amid angry litigation set off by the rush, the California superior court reversed a law which allowed but one well to the acre, and oil derricks began to rise on Yant's old subdivision like quills on a porcupine's back. In less than a week, 44 drilling rigs were trucked up the single road to the field; 10,000 men labored feverishly at the task of tapping the common oil pool below. Last week 154 wells were pumping on one 80-acre tract and 4,000,000 of the pool's estimated 18 million barrels had been sucked out. Though the Placerita boom had knocked the price of crude oil from $2.16 to $1.53 a barrel in Los Angeles, onetime Con-Man Yant and many another were getting rich. Yant was also insisting, to whoever [sic] would listen, that the oil find "vindicated" him. "Some people think I'm a scoundrel and some think I'm a wonderful guy — depending on whether they made or didn't make money out here," he said. "But do you know what? I don't give a damn. I'm gonna eat for the rest of my life, I'll tell you that."